Graphs at a glance: Tories abolished 50% tax rate for people earning more than £150k. 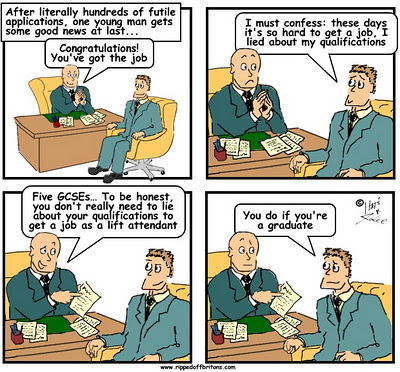 But did you notice the stealthy 51% tax rate for graduates earning more than £43k? Did they or didn't they? Did the Tories abolish the 50% tax rate, or didn't they. a) They Did: People earning more than £150,000 have been spared the 50% rate (52% including 2% National Insurance). b) They Didn't: People with student loans earning more than about £43,000 are heading for a 51% rate (including 2% National Insurance). This is illustrated by a graph in the IFS report "Payback time? Student debt and loan repayments: what will the 2012 reforms mean for graduates?" showing the marginal tax rate for people repaying student loans. Graduates will start paying an additional 9% of their earnings once their pay exceeds £21,000. The 40% income tax rate kicks in at about £43k (assuming 1% annual increases in the upper earning limit). Marginal rate = 40% (income tax) + 2% (NIC) + 9% (Student Loan) = 51%. "it is worth saying that those who take out the loan would face rather high effective marginal withdrawal rates on earnings of 50% for basic rate taxpayers (20% income tax, plus 12% NI, plus 9% repayment of undergraduate loan, plus 9% repayment of postgraduate loan) and 60% for higher rate taxpayers." To clarify, you only pay the above tax rates on the amount of income you get above the thresholds don't you? i.e. If I was on £50K I'd only pay the 40% rate on the £7K I get above the £43K threshold. Also, I don't think it's fair to call the loan repayments tax, because they are loans you're repaying, which is a totally different concept to tax. definitions : a compulsory contribution to state revenue, levied by the government on workers' income and business profits, or added to the cost of some goods, services, and transactions. a strain or heavy demand. "a heavy tax on the reader's attention"
impose a tax on (someone or something). make heavy demands on (someone's powers or resources). A very interesting point made. However as pointed out by Beth above, the various 'taxes' have differing thresholds, and the repayment of tuition fees is not strictly a tax. It is however still interesting that a student is contributing proportionally more to the State than a millionaire. Considering how the entire country benefits from the University system we have, what are your views on making University entirely State-funded? Labour introduced tuition fees in 1998. Before that University was entirely state funded. Before then they were funded by all tax payers, not just the ones why had been to university and were now well paid. The answer therein is to go freelance, if possible. Try calculating the rate for a graduate earning £100k if you want a real shock.